Here is a quick, last minute dish to whip up to take to your friend’s house for Super Bowl or to serve at your next party! Every party I attend always has 7-Layer Dip! Though some people don’t know what it is (Yes! Some really don’t!) It is the best appetizer to serve to guests that just want to hang around, drink some beers and have fun. 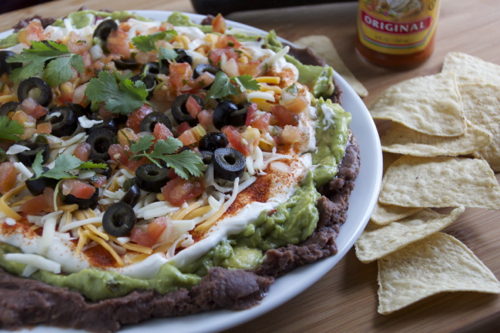 This no-brainer dip is really easy to make, especially if you buy pre-made guacamole. What I love about this recipe is that you really don’t have to measure out anything and you can have as many layers as you want! Just layer the ingredients on top of one another and your done! 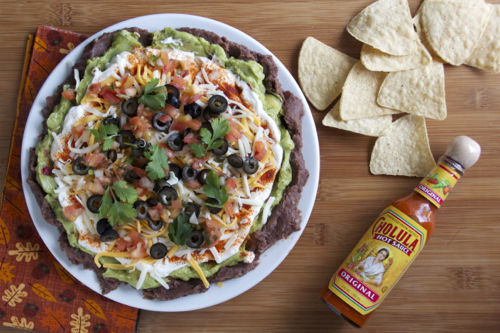 I love to make mine spicy, so I added a hint of cayenne pepper and I topped the dip with some drops of Cholula! Usually this dip has pico de gallo or salsa as a layer but I love the fresh bits of tomato, so I subbed that in. This recipe is perfect for 4-6 people but if you are planning on having more guests, just add more! 1 12 oz Container Trader Joe’s Chunky Spicy Guacamole or homemade of course! 1. Spread the refried beans on the bottom of a deep dish or a wide plate. 2. Top the beans with guacamole. 3. Layer on some sour cream then sprinkle the cayenne pepper on top. 4. Layer with some cheese to cover then top evenly with diced tomatoes and olives. 5. Add cilantro leafs for garnish and flavor!